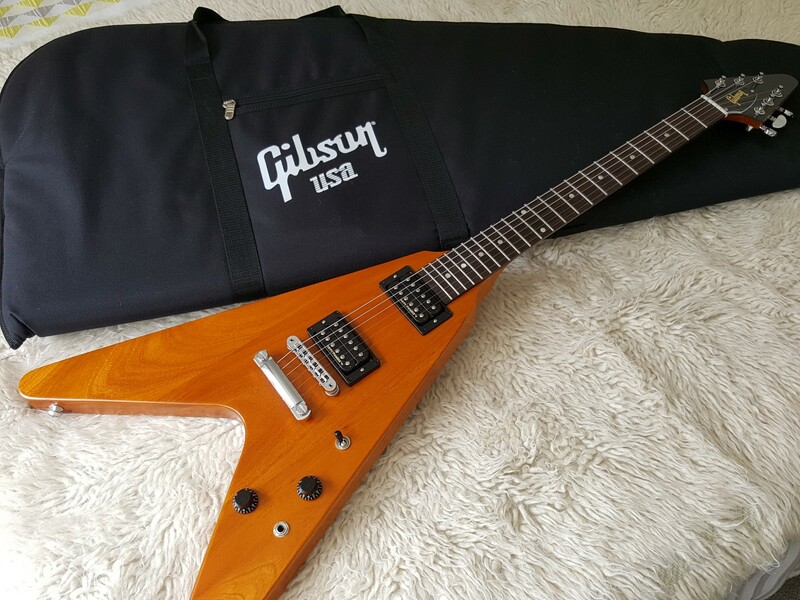 Brand new, the Flying V Faded 2016 Limited from Gibson USA is a simple yet extremely effective take on the Flying V combining both the wow! factor of the Modernist body shape and a Vintage Trans Amber satin finish, adding a vintage vibe to the original rock-certified looks. A pair of our hottest humbucking pickups maintain scorched-earth sonics, so this original radical rocker remains as rebellious as ever. The classic combination of solid mahogany body and glued-in mahogany neck with genuine rosewood fingerboard anchor it all down for superb tonal integrity, and from there we trick it out into totally no-nonsense performance machine. For all-out, no-nonsense playing, a single master Volume and Tone control plus a three-way toggle switch are all you need to dial in a pair of Gibson's hottest humbuckers of all time. The Dirty Fingers+ pickups in both the neck and bridge positions are made with ceramic magnets and over-wound coils, for the ultimate in shred-certified distortion and sizzling sustain, without sacrificing clarity and tonal depth. From classic rock, to grunge, to metal, or even heavier blues styles, this powerful guitar is primed to do it all. A Flying V Slim Taper neck profile offers outstanding speed where you need it most, with the unfettered upper-fret access that this iconic Modernist body style is known for. Our classic hardware complement of Tune-o-matic bridge and stopbar tailpiece lock it all down for solid sustain, while high-quality Grover kidney-button tuners offer excellent tuning efficiency at the headstock end. The great looking and tactile feeling Vintage Trans Amber in satin nitrocellulose lacquer has no pickguard to encumber its raw, rockin' look, while simple acrylic dot markers adorn the rosewood fingerboard. Check out the Flying V Faded 2016 Limited today, and prepare to soar on a supremely affordable rock powerhouse.